All 300 pekes and 100 mishos at Evolución are named according to their personalities. No animal leaves the shelter unless they are adopted. Our Adoption Team makes a home inspection for every applicant. Evolución keeps track of where each of our adopted pekes/mishos lives to ensure they remain in responsible and caring hands. Evolución does not receive financial help from any governmental level. Evolución Volunteers financially support the shelter wholeheartedly because every one of our rescues is a unique, unrepeatable and irreplaceable being: a life! 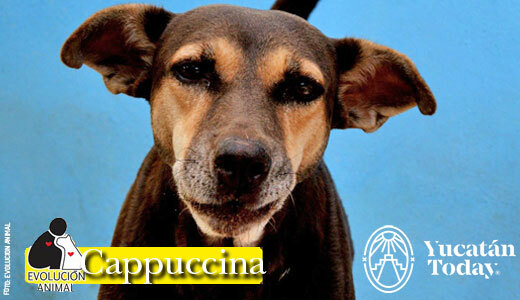 5 – 6 year old Cappuccina is a volunteer favourite! It takes a little while to gain her trust and she prefers tranquillity and human company; however she gets along well with all her shelter pals. Cappuccina is spayed, dewormed and vaccinated. To meet this sophisticated lady, please call 999 193 0628. To see a gallery of photos of pets for adoption, click here. To see some of the pets featured in videos, click here. If you can’t adopt a dog right now, perhaps you can foster, volunteer or make a donation? 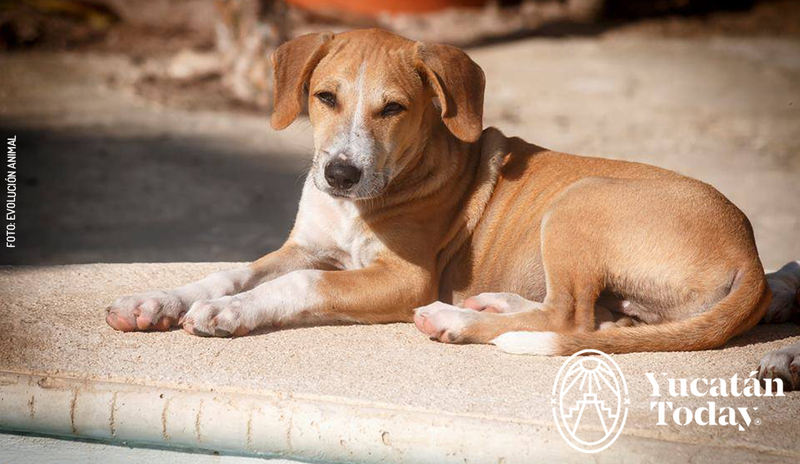 Evolución cares for 210+ dogs and 30+ cats at their shelter located south of Merida, Mexico. Donations buy food, pay for veterinary care and medication, and fund spay and neuter clinics. Finding loving homes for our rescues is at the heart of what Evolución stands for! Evolución is also committed to the education of our children, our youth and our community about their responsibilities for the welfare of companion, street and working animals. Although adoption rates are improving, for every dog that finds a loving home, there are two or more left outside the shelter gates or rescued from the streets. 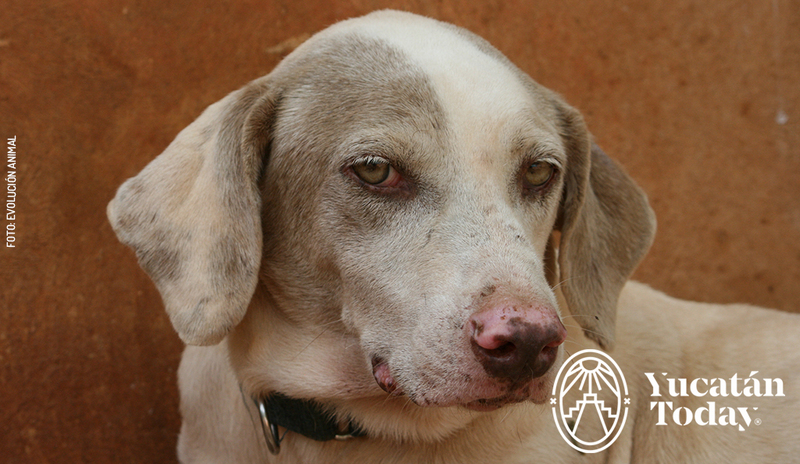 YOU CAN HELP… $15 USD / $290 pesos feeds a shelter dog for an entire month! Go to evolucionanimal.org and donate online. Evolucion is a voluntary run, non-profit Organization, registered with Hacienda – RFC #EKU110127FRA. Thank you for your kindness to these dogs in need! 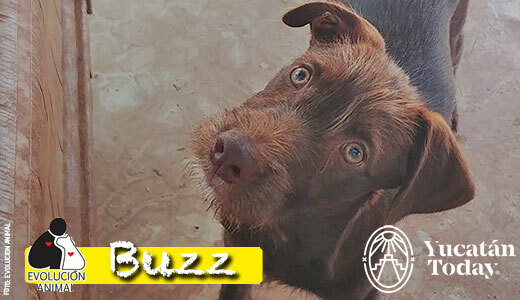 Buzz was abandoned along with his siblings when they were less than one month old. Sadly, two of the pups died after being hit by cars. Buzz is now almost 5 months old and is one very happy puppy who gets along with everyone. He is de-wormed and vaccinated and will be neutered shortly. Buzz needs you to call 999 193 0628. 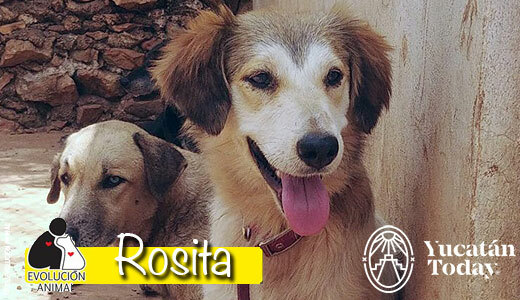 A few months ago, Rosita was hit by a car in Colonia Santa Rosa. Scared and beaten, she sought shelter in a house; from there we rescued her and took her to a vet. Fortunately her injuries were not serious and she has made a complete recovery. Rosita is now 11 months old, very affectionate, cheerful and energetic. 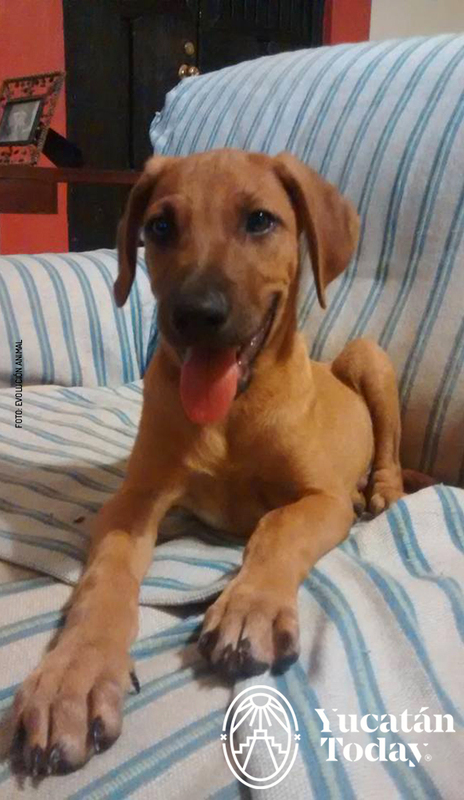 She is looking for a family to play with her and take her for walks. She is dewormed, vaccinated and will be spayed shortly. To meet Rosita please call 999 193 0628. 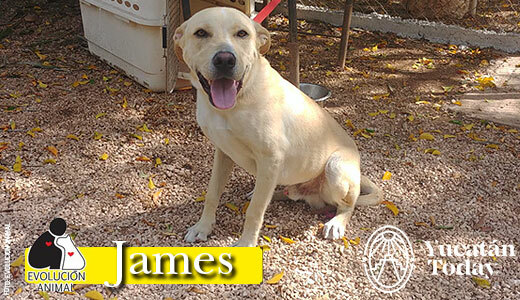 1 year old James was abandoned inside a locked house by his family! Following a legal complaint, the Fiscally asked for Evolución’s assistance to get him out of the house and then placed him into our custody at the shelter. (The authorities look to Evolución in these situations because they don’t have the funds or the facilities to take care of rescued animals.) James is one awesome dog! He gets along with everybody! He is neutered and vaccinated. To meet this friendly boy, please call 999 193 0628. James is waiting for you! Here we have Pachanga, a 2 year old girl, medium sized, spayed. Life did not smile on Pachanga during the first year of her life as she was rescued in very bad condition. 12 months later, with more confidence in people, she looks happy and with a different pose every day to be adopted. Please call 999 193 0628 to meet this special peke. Yang is looking for a forever home!! In November 2017, Evolución responded to a legal complaint regarding a dead female and her two seriously ill puppies. Yang and Ying were suffering from anaemia and tick-bourne diseases (anaplasmiosis and ehrlichiosis) and required two transfusions one week apart. Boots our February 2019 Calendar Girl!! Volunteers say that 3 year old Boots is the perfect dog! Boots is well-behaved, affectionate and she gets along with all the dogs at the shelter. She loves the outdoors and walks well on a leash. Boots is vaccinated, spayed and dewormed. To meet this special lady please call 999 193 0628. 10 months ago Yika was left at the gates of Evolucion. She is 3-4 years old, a Beagle-Terrier mix and a high energy lady. Yika is an alpha female who could get along with a social, omega male. She is vaccinated, spayed and dewormed. For more information on Yika please call 999 193 0628. Gitana and her little sister were abandoned at the gates of Evolución. She is 2 years old, spayed, vaccinated and dewormed. Gitana is very affectionate and sweet with humans and with other cats. She loves to be caressed. .
She is waiting for you to call 999 193 0628. Koko: Chocolatey Pet of the Week!! She’s sweeter than candy with zero calories! She will love you all of her days! Bicco was rescued after being seriously injured when he was about 1 year old. His right front leg was so deeply damaged it could not be saved. Tripod Bicco has adapted very well and leads a perfectly normal life. Bicco is very social with other dogs but shy at first with strangers so it takes a little time to get to know him. Bicco is 4-5 years old, neutered, dewormed and up to date on his shots. Call 999 193 0628 to meet this gentle boy. 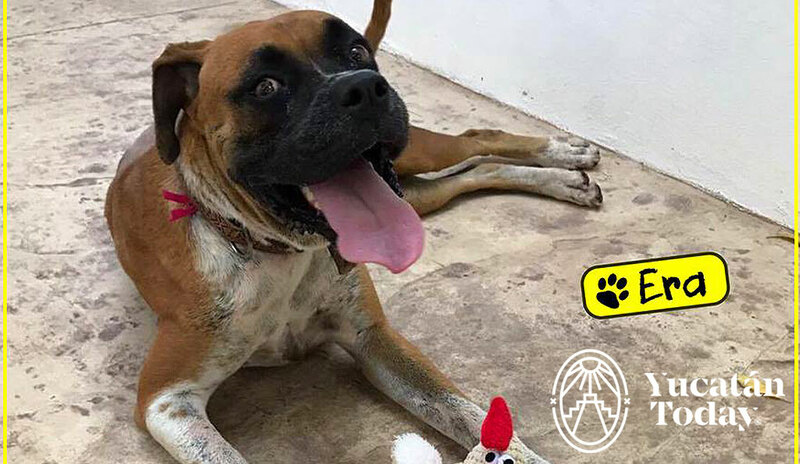 If you cannot adopt Bicco, please share his story with your friends and family as this simple action could change his life! Gracias. Hola my name is Gustav and I’m 3 years old! 2 years ago I was dumped on the streets of Merida where I was very scared, wet and hungry. Luckily for me I was rescued by the authorities and brought to Evolucion. I’m a friendly and affectionate boy, protective of my humans, so I would do best as an only child or with a friendly female pal. I’m handsome too! I’ve been neutered and vaccinated.. I still dream of having a home of my own one day so please call 999 193 0628 to make an appointment to check me out. You won’t be sorry! Paws crossed! Kisses Gustav. Kiwi is approximately 2 years old. He is vaccinated, neutered and dewormed. He is a little shy when he meets you for the first time but after cuddles he soon returns the love he receives. Kiwi is waiting for someone to call 999 193 0628. Sirop, our Evolucion May Calendar Boy, was rescued with two broken legs. He received medical attention until his fractures mended and now Sirop can run and play with his pals. Sirop is an affectionate and playful dog. He is vaccinated and neutered. Sirop is waiting for someone to call 999 918 1028. These cuties are just two of the cats and kittens Evolucion has saved this year. They are playful little darlings who love being the centre of attention. While they are doing well in the cattery, they would be so much happier with loving families to call their own. All they want out of life is a good snuggle, a treat and a nap in the sunshine. The kittens are healthy and have been vaccinated. They are waiting for you to pick up the phone and call 999 193 0628. If you can’t adopt right now, perhaps you can foster, volunteer or make a donation? Unwanted, abandoned animals are why we are so passionate about spay and neutering so these kittens will be sterilized to prevent history repeating itself. This beautiful Evolucion rescue may be the company you are looking for! Laila is very well behaved and so very loving. She is vaccinated, spayed and de-wormed. Laila is waiting for you to call 999 193 0628. Laila invites you to the OPENING OF OUR CATTERY EXTENSION – DECEMBER 19 AT 10:00 A.M. Two years ago we built our first cattery designed to comfortably shelter 30 rescues. Today, that space has been exceeded due to the high demand we receive to support wounded mishos and the abandonment of cats and kittens at our gates. Early this year we started the construction of the extension of our cattery, which is NOT intended to receive more cats, but to provide them a better quality of life. Meet 5 month old Chiqui!! About three months ago Evolucion rescued a female and her 4 newborn pups from a busy Merida street. All four pups are now happy and healthy and so ready for their forever homes. They are vaccinated, dewormed and will be sterilized soon. Piratita (second from the left) was adopted last week, but her siblings are hoping that a special someone will come along for them. Please call 999 193 0628 today. Juanpa wants you to know!! Evolucion Volunteers financially support the shelter wholeheartedly because every one of our rescues is a unique, unrepeatable and irreplaceable being: a life! To find out more about Evolucion please call 999 193 0628. Piratitas Siblings looking for you!! Punky – Evolucion’s 2019 June Calendar Girl!! 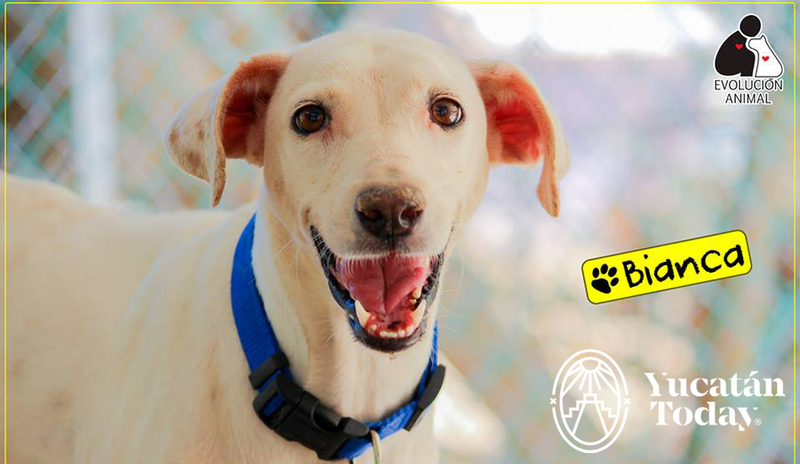 Punky was rescued from the streets wearing a collar but sadly her family did not claim her. She’s such a playful, energetic and happy girl – a little bit shy when meeting people for the first time but she soon warms up. Punky gets along with everyone but needs an active family. She is about 1 year old, vaccinated and spayed. To meet Punky or any of our adoptable dogs and cats please call 9991930628 to visit our shelter. Vlad: Pepper to his friends! 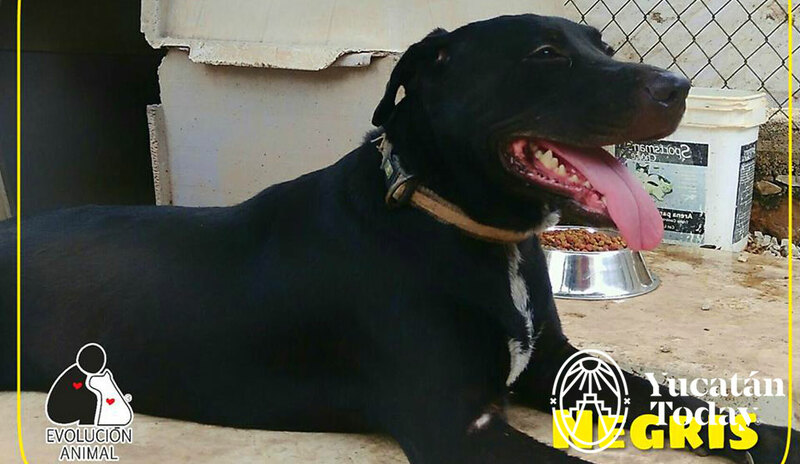 Vlad is about to complete a year at the shelter after living on the streets of Merida. He was 6 months old when he arrived and he has blossomed into a beautiful, big, affectionate and playful boy. Vlad enjoys his walks with the paws on pavement volunteers as he gets along with all the dogs at Evolucion. He is vaccinated and sterilized. If you have space in your heart, in your family, in your home, in your day, to make Vlad part of your life, start your adoption process today. Call 9991930628 for more information. Nicole is one of many adorable angels we have at the shelter at the moment. Nicole is completely fearless and gets along with the big dogs. All our pups love a good cuddle, a treat and a nap outside in the sunshine. Come and check out these cuties as they are just too cuddly to pass up. Pick up the phone and call 999 193 0628 today. If you can’t adopt a puppy right now, perhaps you can foster, volunteer or make a donation! Unwanted, abandoned pups are why we are so passionate about spay and neutering so these pups will be sterilized to prevent history repeating itself. At Evolución, rescued is our favourite breed and we hope is yours as well. Please share to help Nicole and her pals find their forever homes. After 6 years of being adopted, her family returned her to Evolucion because a new human member came into their family. They describe Lechuga as the ideal dog. 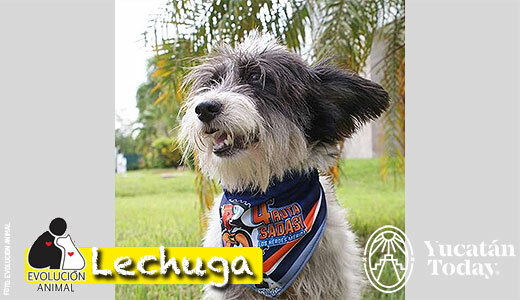 Lechuga is precious, affectionate and playful : perfection! To meet this cutie please call 999 193 0628. Evolución volunteers never stop dreaming! 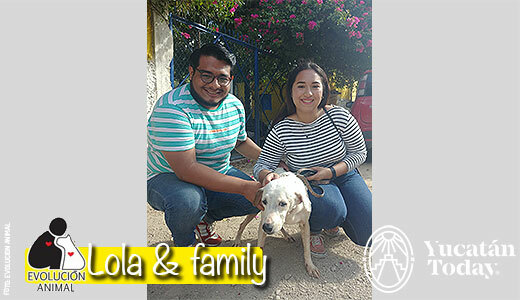 After twelve years at Evolución, Lola has left our sanctuary and is now part of a loving family! Our hearts are a tangle of joy and nostalgia, a great deal of nostalgia. Lola arrived as a puppy along with her twin, Debbie. At that time there were no social networks; we announced our pekes by paying advertisements in the local newspaper. (Lola and Debbie were Yucatan Today’s featured pets of the week in Feb 2014.) They loved to go for a walk and were the darlings of the Paws on Pavement volunteers. Debbie left us two years ago and looks after Lola from the end of the Rainbow Bridge. Last week Lola left happy thinking that she was going for a walk with these wonderful people and now she will spend her golden years in comfort and love. We love you to infinity and beyond dear Lola, we will love you always. So be it for every peke and misho in need of a home. We invite you to visit Evolución to meet all our wonderful rescues waiting for their forever homes! Call 999 193 0628. Claudi is looking for a family! I’m Claudi. The volunteers whisper in my ear that I have such a beautiful face and that a special someone will come along for me very soon. Fingers and paws crossed! While I’m lovingly cared for at Evolucion, I need a family to call my very own. Could you be the family for me? I have been vaccinated and spayed. If you cannot adopt, please share my story as one click could change my life! Kisses, Claudi. Ponchito a clever and charismatic boy! Hola! Ponchito is my name and I am 8 years young! I’m a confident and charismatic boy. I have the attitude of a big dog in a little body. I’m clever, cute, and would be content to snuggle in your lap. Please call 999 193 0628 to meet me. Hugs, Ponchito. Mistery has lots of love to give! Hola! My name is Mystery and I have been at Evolución for an awfully long time. I’m 8 to 9 years old! I’m a lady who likes easy walks and peace. I get along well with other dogs and would be best in a chilled-out home where I can spend quiet, happy days with my family. I may be slightly older but I have lots and lots of love to give! I’m looking for someone who could spare the time to meet me at the shelter a few times to help me get to know them. My dream is to stretch out on a big cozy bed and watch the world go by! The volunteers tell me that I am a sweet girl who really deserves a comfortable retirement. If you cannot adopt me please share my story. Adoption just takes two hearts! These little cuties will fit into most home environments with other dogs, cats and children. They are vaccinated and dewormed and will be sterilized before adoption. If you are interested in rehoming one or both of these little beauties please call 999 193 0628 to start the adoption process. My favourite things in my world are snuggling, cuddling, playing, sleeping and just being a puppy! Please help Evolución find me a forever home by sharing this post with your family and friends. Remember: It only takes one person to fall in love with my photo to change my life forever! Please call 999 193 0628. August 3l st was Evolución’s 12th anniversary! Imagine a community where fewer dogs are left hungry and abandoned on the streets and more dogs find happy, healthy homes. Thanks to Friends of Evolución we are making a difference, one rescue at a time! 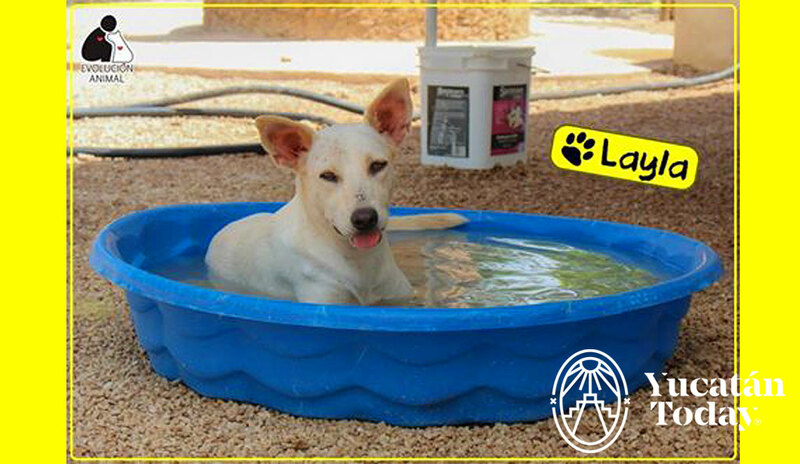 Lola invites you to come by the shelter to meet all the wonderful dogs available for adoption. Evolución is open every day of the year from 9 am to Noon. Could Ich be the ideal misha for your family? As you can see, Ich is a beautiful EvoluMisha! Ich is a curious cat who gets on with her shelter pals. She is litter trained, sterilized, vaccinated and dewormed. Please call 999 193 0628 today! My name is Vader! I’m looking for my forever home. I have many feline pals waiting with me for that special someone to come along. So take advantage of your vacation to come and meet us and adopt. I’m waiting for you already. Sweet as can be, very affectionate and playful! My name is Pumba and I’m looking for my forever home. I have many puppy pals waiting with me for that special someone to come along. Shanti’s sister was adopted last week but he is hoping that someone will come for him very soon. Call 9991930628 to get more info on this cutie pie! Shanti is waiting for you! Hola, I’m Sara! Sadly my family did not respect nor comply with the commitments they made when they adopted me from Evolución. They put my safety and well-being at risk so a few weeks ago I returned to the shelter. The people who adopted me said they loved animals, but loving someone is demonstrated by actions, not words. Today I’m looking for a new family who understand that loving me means taking care of me; that adopting me is a commitment for life; and that I will be totally dependent on my humans. I’m cheerful, smiling, loving, but I prefer to be the only peke at home. I’m ready! If you are ready, please call 999 193 0628 and we will be a loving family. Woof, woof! (I wait for you!) Hugs, Sara. Monstruo, the micro-warrior of great character! 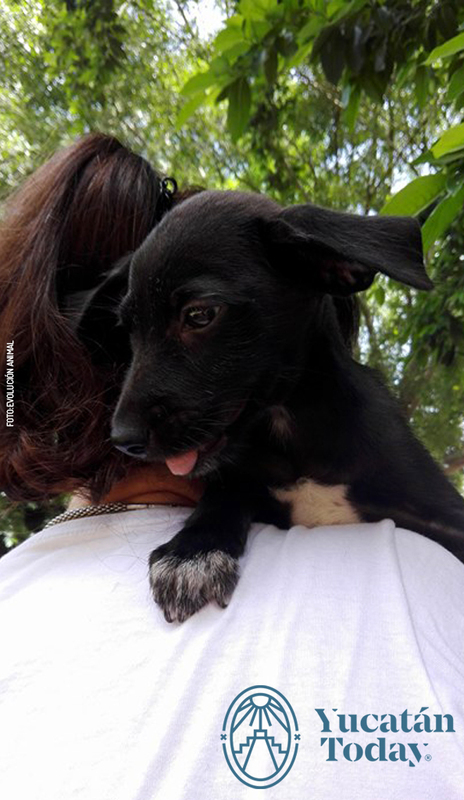 Mostruo was abandoned on the streets of Mérida in the rain when he was just under 3 weeks old. He was soaked, full of parasites, fleas, ticks and had skin issues. He has been receiving medical treatment. Currently he must be little more than 6 weeks old. This little pup has incredible spirit and personality. Mostruo is a micro-warrior of great character! Mostruo requires a home so if you cannot adopt him, please share his story with friends and family. Please call 999 193 0628 for more information. Mostruo is waiting. My name is Hazel and I’m looking for my forever home. I’m almost 2 months young! I’m tender, affectionate and very playful, I love everyone! We have many puppies in the shelter waiting with me for that special someone to come along. So take advantage of your vacation to come and meet us and adopt. Please call 999 193 0628 today! I’m waiting for you already. Hugs, Hazel. Kibi likes cuddles and walks! July 3, 2018: Early one morning 18 months ago Kibi was left outside the shelter gates and he refused to move. He was given food and water. Kibi spent the entire day waiting and at dusk he finally understood his owners would not be coming back for him and he allowed the volunteers to take him inside. Kibi lives with a group of pekes, all waiting every day for a family to arrive and choose them to share their lives. Kibi is approximately 4 years old, vaccinated, dewormed and sterilized. Kibi likes cuddles, walks and moderate exercise. Call 999 193 0628 to start his adoption process. Kibi is waiting! Roque and his special pals do not need any special attention. If you adopt any of these remarkable dogs you will take home a great life teacher! They overcame their disability and became stronger using their other skills. And they have learned to trust humans again. Let yourself be amazed. Call 9991 93 06 28 today. Lucero, a beautiful pit bull with soulful eyes of honey! June 19, 2018: Evolución was told about a dog missing part of her back leg. Her owners initially accepted offers of financial help and transport from the person that contacted the shelter but then claimed that their dog was being attended to. Sadly this was not the case. Evolución helped with a denuncia and follow up with the State Attorney General’s Office and the Animal Protection Unit. Lucero was then placed under Evolución’s legal custody but her leg could not be saved. After the amputation, Lucero came to Evolución full of joy, overcoming with her every movement her new disability. Her tail is always wagging! She is all about making new friends, giving love and being snuggled. Lucero requires no special care for her disability; however she needs to be an only child. Looking for a friend with a great spirit? Then Lucero is your girl! Call 999 193 0628 today to meet this special lady. June 12, 2018: What can we tell you about Taily to get her adopted real soon? Well… Taily is a volunteer favourite because she’s one of the gentlest dogs at the shelter and the happiest girl ever! Taily loves people and just wants to be close to cuddle and be told she’s a good girl! She needs an active family and to be the only pet. Taily is about 2 years old and will be spayed shortly. For more information on this friendly lady please call 9991 93 06 28. Laila may be the company you are looking for! June 5, 2018: This beautiful Evolución rescue may be the company you are looking for! Laila is very well behaved and very loving. She is vaccinated, spayed and de-wormed. Laila is waiting for you to call 999 312 87 83. Dona is very affectionate with her shelter and human pals! 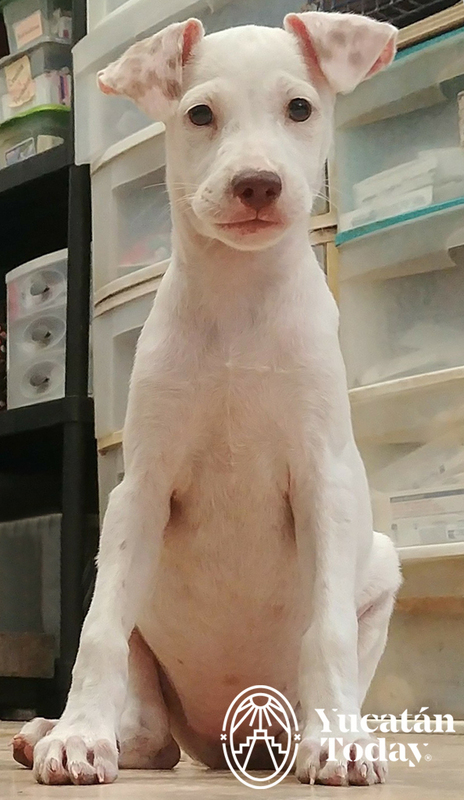 May 29, 2018: Dona was rescued as a puppy with her mother and sister. Dona played happily with them and was sociable with the volunteers. Once Mama Malupi and her sister Conchita were adopted, Dona began to hide in a corner of the shelter. Volunteers spent time getting to know Dona on her terms, giving her yummy treats, baths, walks and cuddles. 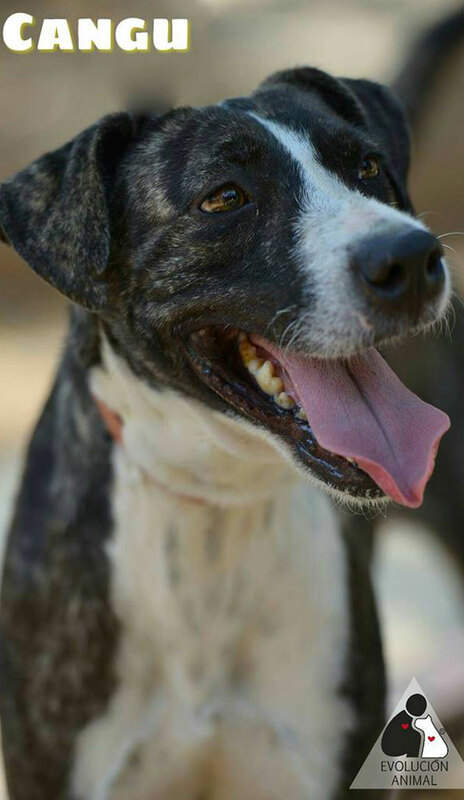 Now Dona coexists very well with her shelter pals and is very affectionate with her humans. Each pet has a different story with different needs. Come and meet them! If you would like more info on Dona please call 999 193 0628. May 22, 2018: Sandía is a very well-behaved cat. She is gentle and peaceful and will surely make a great companion for you. She is very clever and sweet, has been spayed and has her vaccines up to date. If you want to adopt her come to Evolución Animal Shelter and meet her! Call 999 193 0628. 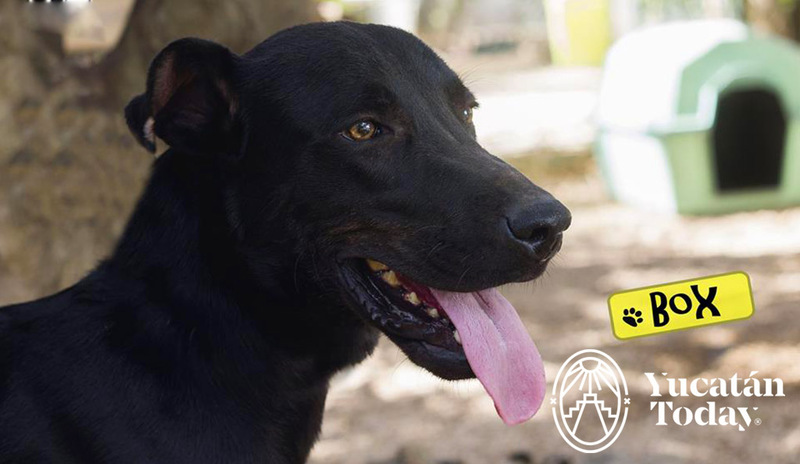 Flaco is a highly active dog bursting with energy! Twist is such a happy boy! May 1, 2018: Twist‘s leg was broken before he came to the shelter and it healed twisted backward. One year ago, funds were raised to have his leg amputated on the recommendation of a veterinarian. Twist is now such a happy boy without his useless and painful leg. He is able to run and play with his pals. Twist is dewormed, vaccinated and neutered. All he needs is for that special someone to come along so won’t you call 999 193 0628 today. 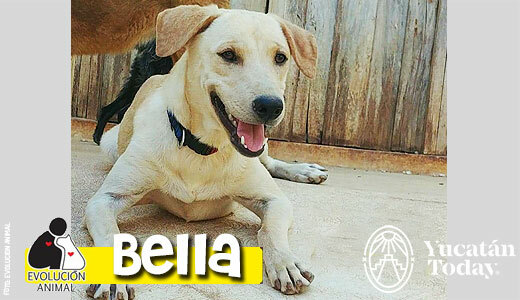 April 24, 2018: 9 month old Bella is playful and affectionate. She has a very relaxed attitude that makes her coexist very well with other dogs. She is sterilized, vaccinated and dewormed. 5 months ago she was left outside the shelter in a cardboard box! Can you offer this lovely dog a new home? If so, please call 999 193 0628. Bella is waiting. I’ll always be by your side and we’ll play a lot! April 17, 2018: Hola! Cindy here! I wish you a sunny and joyful day! I’m about 20 months old, vaccinated, dewormed and spayed. I’m a little shy with strangers but when I get to know you I’ll cover you with kisses! I’ll always be by your side and we’ll play a lot! Come to Evolucion to meet me! If you cannot adopt please share my post with your family and friends. Call 999 193 0628. I’m waiting for my special family to come along! Hugs and kisses, Cindy. Turix loves going for walks! April 3, 2018: 7 year old Turix had a home for the first 7 months of his life but his family then moved house and abandoned him. Turix found shelter under a doorway and scrounged for food until the day he was hit by a car and was was brought to Evolucion. Troy lost an eye as a result of the accident and was very scared of people when he arrived at the shelter. He is healthy and patiently waiting for his forever home. Turix leads a very normal life notwithstanding having only 1 eye. He is still a little shy when you first meet him, but comes out of his shell with a little patience and a yummy treat or two. Once he knows you, he is affectionate and protective. He loves going for walks. To meet Turix please call 999 193 0628. If you cannot adopt Turix please share his story and photo with your friends and family. This simple action could change his life! Gracias. Troy needs a gentle home! March 27, 2018: Tripod Troy was rescued after being seriously injured by a car when he was about a year old. Although both of his back legs were injured, the vet was able to save one but had to amputate the other. Troy has adapted well and leads a perfectly normal life. Troy gets along with other dogs very well but is shy with strangers. 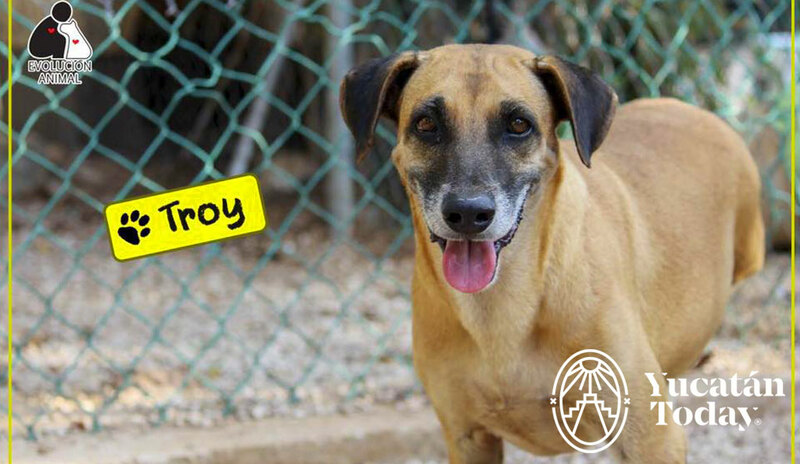 Whoever is lucky enough to adopt this gentle boy will need to be patient with him, getting to know Troy at the shelter beforehand to gain his trust. He is approximately 6 1/2 years old and neutered. Troy would do best in a home with no small children. To meet Troy please call 999 193 0628. If you cannot adopt Troy please share his story and photo with your friends and family. This simple action could change his life! Gracias. March 6, 2018: I’m very calm and affectionate. I’m no longer a youngster, but I have lots of love to give. I’m energetic and love to go for a walk. I love having my ears scratched! I’m looking for a beautiful family to love me very much. We’re going to be family? Please call 999 193 0628 to start my adoption process; if you can not adopt me, please share my post; with that small action you could change my life. Woof! Woof! Ponchito. We are ready to be adopted! February 27, 2018: Holitaaas! In February, I was rescued along with my 6 orphaned brothers and sisters. Our mum was killed and we seven were left to fend our ourselves in an abandoned lot. Well… since then a foster family has taken great care of all seven of us. We are healthy, chubby and ready to be adopted! And we are all cute, cute and cute!! ❤❤❤❤❤❤❤ We have been dewormed and vaccinated and are looking for loving, responsible families to call our very own. Are you ready? If so, please call 999 193 0628 to start the adoption process. If you cannot adopt, please share our story as this simple action could change our lives. Kisses, Chata, then Lucho, Chikis, Motis, Guera, Sam and Max. Chatito is very affectionate and playful! Looking for love? So is Chucho! February 6, 2018: Looking for love? So is Chucho! He did not have such a great start in life but is now ready for his forever home. He is a happy, healthy and playful boy who gets along with everyone. Chucho is dewormed, neutered and up to date on his shots. To meet this gentle boy please call 999 193 0628. If you cannot adopt but want to help Chucho, please share his posting with your friends and family. Gracias. January 30, 2018: Hola, I’m Bucle! I was rescued tied to the fence of a property on Ave. Aviación. I was very sick, (I survived distemper!) but now I’m enjoying life! I love to cuddle, to lie on soft pillows and to be close to people. Come and meet me and the my fellow rescues at the shelter. Call 999 193 0628 to start my adoption process. Kisses Bucle xxxxxx p.s. If you cannot adopt please share my photo and story. Gracias. January 16, 2018: Hello! my name is Kau! I arrived at Evolucion because my family did not have adequate security in their home; there were no fences, so I could easily escape onto the streets of Uman. One day after a problem with a neighbor the police intervened and, sadly, my family decided that they did not want me anymore! The police took me into permanent custody and brought me to Evolucion in the hope that I would find a responsible family to care for me. I was very weak and full of ticks. I was given vitamins, good food and treated for Ehrlichiosis and Anaplasmosis. At the shelter I do not lack for food or medicines or TLC. I have been vaccinated, sterilized and dewormed. I’m very affectionate with humans, very protective, so need to be an only child. I require a high walled yard to play in! I’m ready and waiting! Are you ready to adopt me? If so please call 999 918 1029 today. Hugs Kau. Roque wants to go home with you! January 9, 2018: Two years ago, Roque was hit by a car not very far from the shelter. Evolucion received word that he had a broken leg but the people feeding him couldn’t afford the medical attention he urgently needed. He was taken to Veterinaria Medi Vet Uman but his leg was so badly damaged it could not be saved. 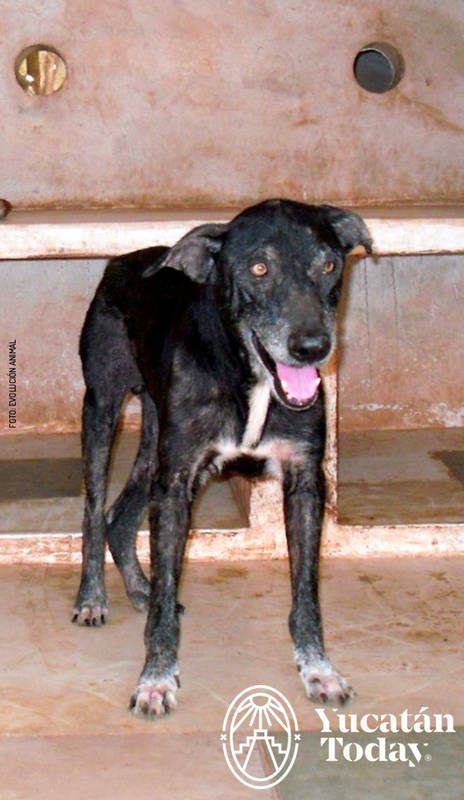 The family who had been feeding Roque asked to adopt him. The main condition of adoption was that they would not allow him to roam the streets. The adoption papers were signed but a few months later a volunteer saw him running in traffic. Talked with his owners and they said it was an accident that he was free, but a short time later he was found on the street wandering. Roque was brought to the shelter. Roque has adapted well to living life as a tripod and has thrived with Tender Loving Care and a full tummy! If you have a safe house and can give Roque a loving home please call 999 193 0628. Puppies in Adoption for New Year! January 2, 2018: Looking for love this new year? So are Evolucion’s precious babies! They did not have such a great start in life but are now ready for their forever homes. They are healthy and have started their puppy shots. Have you got room in your heart for one (or two) of our bundles of joy? The puppies are little balls of energy and sweetness, eager to lick your face and ready to play. If you have a safe house and can provide a loving home please call 999 193 0628. Enzo is ready to be adopted! December 26, 2017: Enzo was very hard to handle when he was rescued, even today he doesn’t like his neck to be touched. But he’s a very active and energetic boy, loves his walks. A Paws on Pavement favourite. If you have a safe house and can give Enzo a loving home please call 999 193 0628. 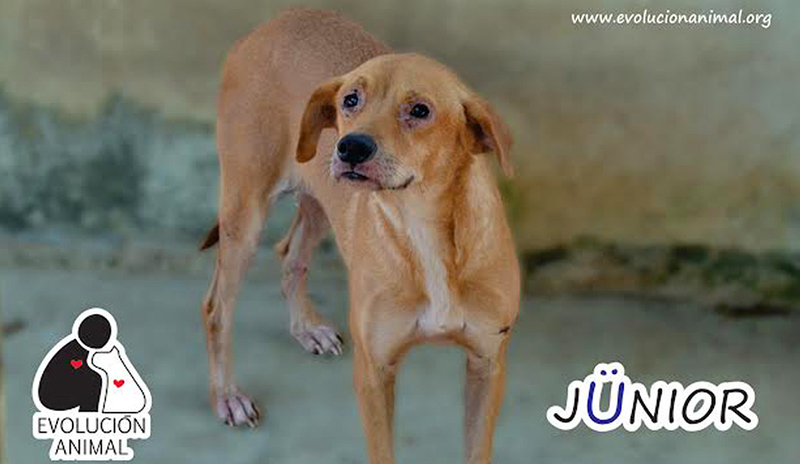 December 19, 2017: Juanpa was rescued from the streets of Merida skinny and suffering. 8 months ago he was completely helpless being unable to move his body. He was treated at clinic “El Arca de Noé” where his body responded very well to treatment and 7 days later he was able to eat on his own. Two weeks later at Evolucion, Juanpa could stand and walk. Today, he is one of our big-boy pekes — healthy, cheerful, muscular, strong, playful and eager for affection. 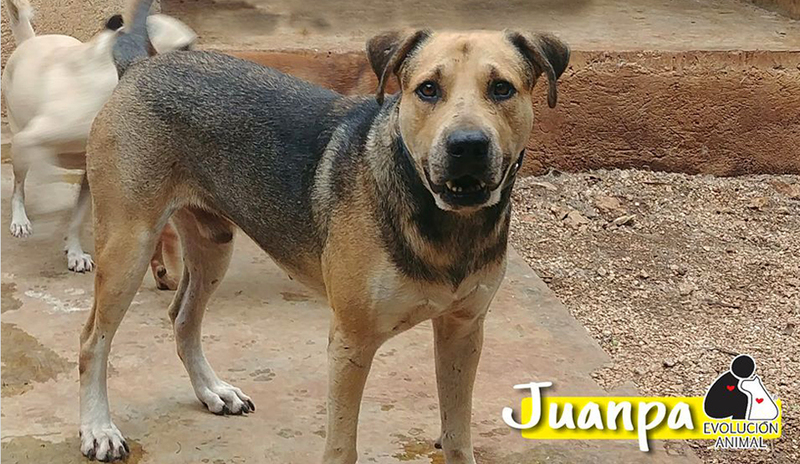 Do you have a place in your heart for Juanpa? If so please call 999 193 0628 to meet him! If you cannot adopt please share Juanpa’s story with your family and friends. Thank you. Hello! 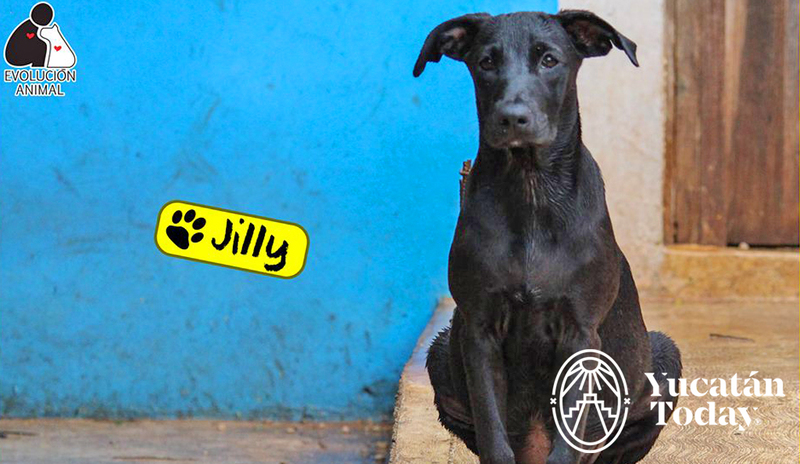 My name is Jilly. December 12, 2017: I arrived at Evolucion with my little brother, Willy, when we were puppies. I’m one year old now and still waiting for that special someone to come along. I’m very cheerful and playful, just perfect for a family with children. I’m spayed and up-to-date on my shots. Please call 999 193 0628 to meet me. Kisses, Jilly. December 5, 2017: Bianca is a 6 year old lady who needs a home of her own without other dogs or cats. She is so sweet with people, she loves attention and cuddling. Bianca would be a wonderful companion; once adopted she would adore her owner and be faithful forever. Her love for people results in some jealousy issues as she will not want to share her family with another pet. Apart from this, she is a happy and healthy dog who will walk nicely by your side on the leash. She is spayed and up to date on all her shots. For more information on Bianca, please call 999 193 0628. 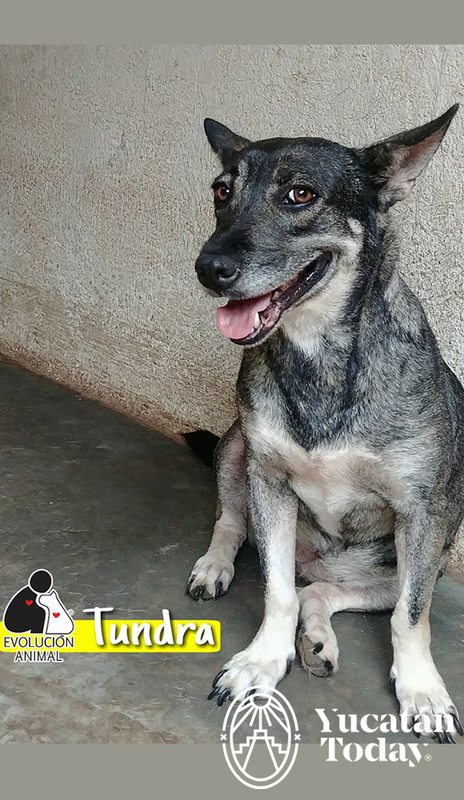 November 21, 2017: Tundra arrived at Evolución two years ago and has not yet received an adoption request. She will be shy when meeting you at first but after a cuddle and a treat you will have permission to scratch her tummy! Tundra is spayed and up to date on her shots. She just needs you to call 9991 93 06 28. Tiggy is such a cutie! November 14, 2017: Tiggy is sterilized and vaccinated. He is a playful puppy, very friendly and very affectionate…an ideal companion for children, Tiggy just needs a family of his own to make his life complete. If you have a safe house and can give him a loving home please call 9991 93 06 28. November 7, 2017: Looking for love? So are Evolucion’s precious babies! They did not have such a great start in life but are now ready for their forever homes. They are healthy and have started their puppy shots. If you’ve got room in your heart for one (or two) of our bundles of joy, please call 999 193 0628 today. The puppies are little balls of energy and sweetness, eager to lick your face and ready to play. If you cannot adopt but want to help, please share this posting and photo with your friends and family. Gracias. October 24, 2017: I was abandoned in a cardboard box at the gates of Evolución with my little brother Tino. Hello, my name is Marlon! October 10, 2017: I was rescued with a fractured jaw which hurt so much and required surgery. I’m well now and ready to join a loving family. Not to be presumptuous but I’m a very handsome boy, about 4 years old, active and protective. Please call 9991 93 06 28 to get more info about me. If you cannot adopt please share my story with your family and friends. Kisses, Marlon. Hi, my name is Claudi! September 19, 2017: Looking for love? So are Evolucion’s precious babies! They did not have such a great start in life but are now ready for their forever homes. They are healthy and have started their puppy shots. If you’ve got room in your heart for one (or two) of our bundles of joy, please call 9991 93 06 28 today. The puppies are little balls of energy and sweetness, eager to lick your face and ready to play. Your support will extend the promise of a lifetime of love and happiness for little Claudi and all her puppy pals at the shelter. If you cannot adopt but want to help, please share this posting and photos with your friends and family. Gracias. Hi, my name is Fizz! September 12, 2017: Looking for love? So are Evolucion’s precious babies! They did not have such a great start in life but are now ready for their forever homes. They are healthy and have started their puppy shots. If you’ve got room in your heart for one (or two) of our bundles of joy, please call 9991 93 06 28 today. The puppies are little balls of energy and sweetness, eager to lick your face and ready to play. Your support will extend the promise of a lifetime of love and happiness for little Fizz and all his puppy pals at the shelter. If you cannot adopt but want to help, please share this posting and photos with your friends and family. Gracias. Hi, my name is Ting! September 5, 2017: Looking for love? So are Evolucion’s precious babies! They did not have such a great start in life but are now ready for their forever homes. They are healthy and have started their puppy shots. If you’ve got room in your heart for one (or two) of our bundles of joy, please call 9991 93 06 28 today. The puppies are little balls of energy and sweetness, eager to lick your face and ready to play. 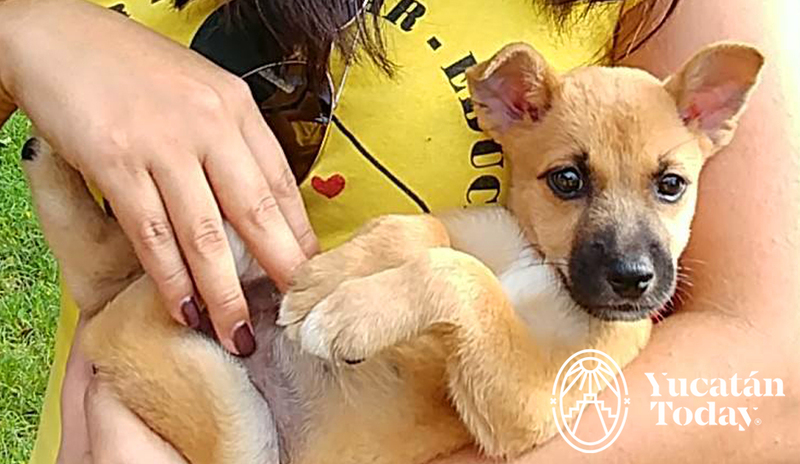 Your support will extend the promise of a lifetime of love and happiness for little Ting and all his puppy pals at the shelter. If you cannot adopt but want to help, please share this posting and photos with your friends and family. Gracias. Hi, my name is Poppy! August 22, 2017: Looking for love? So are Evolucion’s precious babies! They did not have such a great start in life but are now ready for their forever homes. They are healthy and have started their puppy shots. If you’ve got room in your heart for one (or two) of our bundles of joy, please call 9991 93 06 28 today. The puppies are little balls of energy and sweetness, eager to lick your face and ready to play. Your support will extend the promise of a lifetime of love and happiness for little Poppy and all her puppy pals at the shelter. If you cannot adopt but want to help, please share this posting and photos with your friends and family. Gracias. Hi, my name is Mocas! 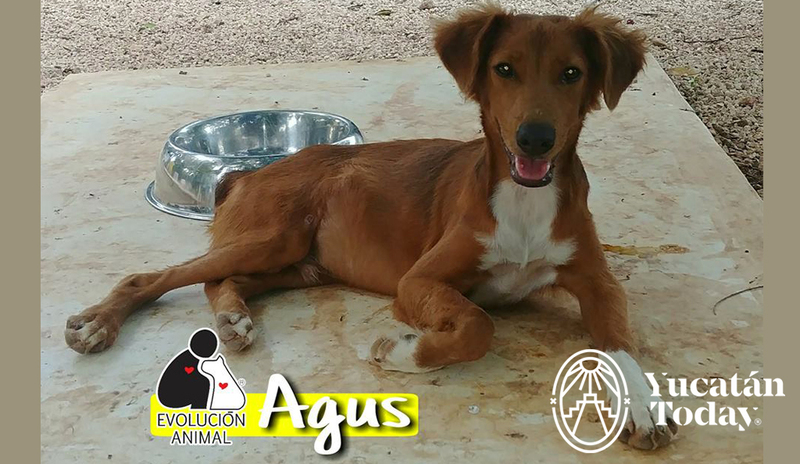 August 1, 2017: Mocas is a healthy Evolución long-timer who has been patiently waiting for his forever home! 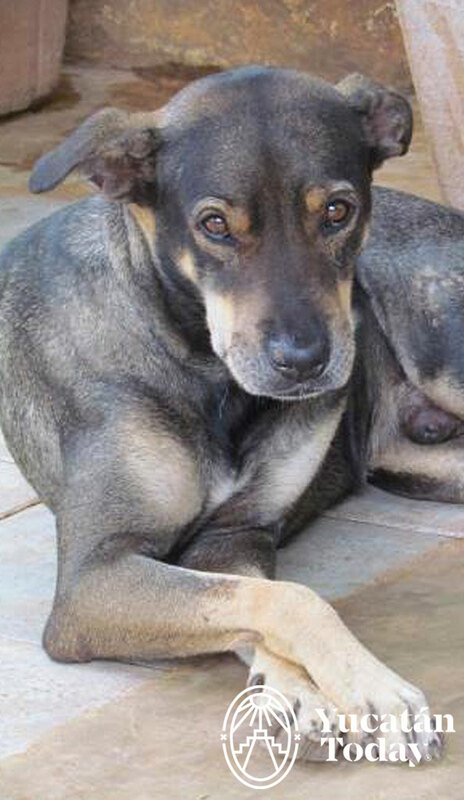 He is a calm and affectionate guy who gets along well with people and other dogs. Mocas is well behaved on the lead and loves going out for a walk with the Paws on Pavement volunteers. He is neutered and up to date on his shots. Make this special boy’s dreams come true by calling 9991 93 06 28 or visit the shelter to meet him. If you cannot adopt please share this post as adoption just takes two hearts! Gracias. Hi, my name is Coqueta! July 25, 2017: Coqueta is a beautiful, young lady with clear and bright eyes. 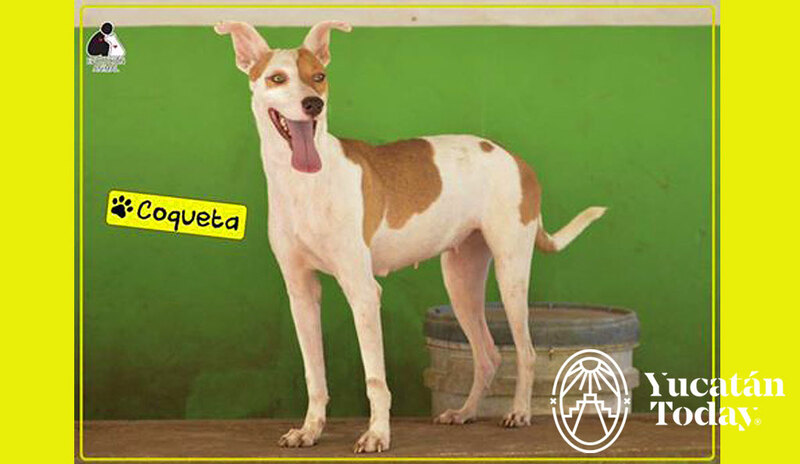 She is playful, affectionate and has a very relaxed attitude that makes her coexist very well with other dogs. She is sterilized, vaccinated and dewormed. Can you offer this lovely dog a new home? If so, please call 9991 93 06 28. Coqueta is waiting. Hi, my name is Era! July 11, 2017: Era is a young peke who was rescued from a home where she had no contact with her owners being isolated in a small area. Era was placed in a temporary home which helped restore Era to optimal health and emotional well-being. She is now one affectionate, obedient, playful and very intelligent dog. Era loves her walks and playing with her toys. She is spayed and vaccinated. Now she waits for her forever or temporary home where she will be part of a family. To meet this special lady please call 9991 93 06 28. Guess why the volunteers named me Cangu? July 4, 2017: Its because I jump very high and have so much energy! I’m looking for a loving family who will to play with me and have me as their only daughter. I’m two years old and am sterilized and up to date on my shots. I was rescued as a pup, and I’ve been waiting for a loving home ever since. I am very affectionate and protective of people. Please call 9991 93 06 28 to meet me. Woof, Woof! Cangu. Hi, my name is Troy! June 27, 2017: When he was one year old, Troy was hit by a car. His two hind legs were seriously injured but only one leg could be fully rehabilitated, the other was amputated. Being a tripod has not been a problem for Troy. 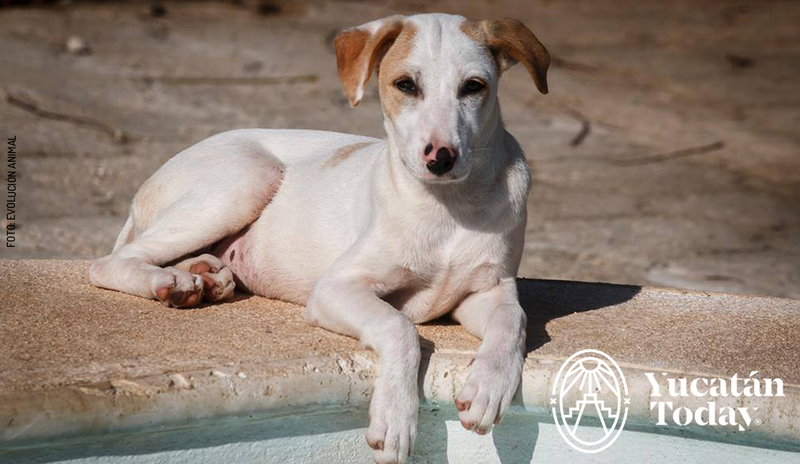 At Evolución, he has come to trust humans and live with other dogs and is a happy and healthy boy. He is neutered and vaccinated. 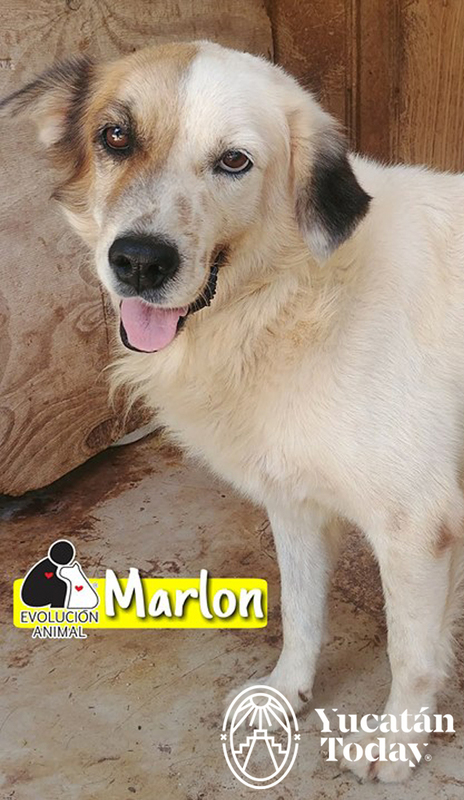 Call 9991 93 06 28 for more information on this special boy or come and meet him at Evolución, Monday to Sunday from 9 am to 12 pm. Hey! Look how handsome and healthy I look in my picture! June 20, 2017: Well, I’m healthy and happy now but 14 months ago, when I came to Evolución, I had so many nasty health problems. I’m mega-social, loving and playful. I’m already vaccinated, dewormed and sterilized and waiting for a family to call my own. I’m hoping someone will call 9991 93 06 28 real soon. If you cannot adopt me, please share my post; a simple touch of your finger in “sharing” could mean a home for me. Hugs and Kisses, Negris. Hello! My name is Kau! June 13, 2017: I arrived at Evolución because my family did not have adequate security in their home; there were no fences so I could easily escape onto the streets of Uman. One day after a problem with a neighbor the police intervened and, sadly, my family decided that they did not want me anymore! The police took me into permanent custody and brought me to Evolución so I could find a responsible family to care for me. I was very weak and full of ticks so I was given vitamins, good food and treated for Ehrlichiosis and Anaplasmosis. At the shelter I do not lack for food or medicines or TLC. I have been vaccinated, sterilized and dewormed. I’m very affectionate with humans, very protective, so I need to be an only child. I have lots of energy so am looking for an active family. And I require a fenced yard to play in! I’m ready and waiting! Are you ready to adopt me? Hugs Kau. Layla is an absolute sweetheart! June 6, 2017: Layla is fun, young, active, playful and happy. She adores being around other dogs but her favourite thing in the world is her paddling pool. She loves treats. Layla is spayed, vaccinated and dewormed. Meet her at Evolución, Monday to Sunday from 9 am to 12 pm. Google Map https://goo.gl/AjJ9Pn. Call 9991 93 06 28 for more details on this lovely lady. Fella is waiting for you! May 16, 2017: Fella is hoping for a special someone to call her very own. She is happy and affectionate and gets along well with all the dogs at the shelter. Fella loves a cuddle and a treat. She is spayed, vaccinated and dewormed. 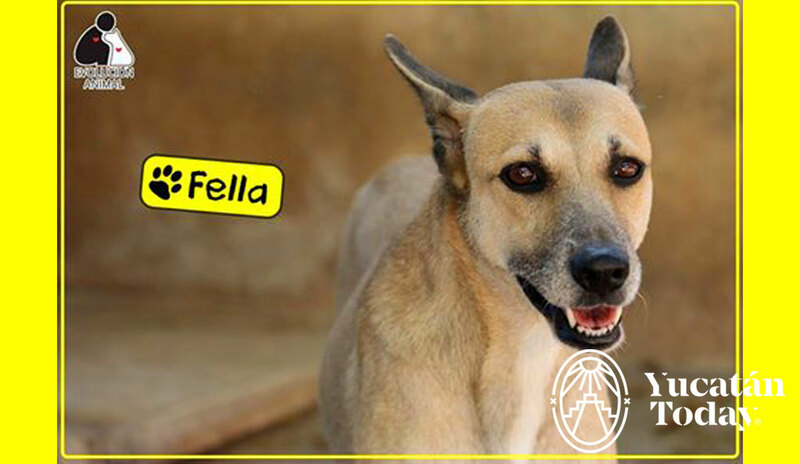 Come and meet Fella at Evolución, Monday to Sunday from 9 am to 12 pm, (Google Map https://goo.gl/AjJ9Pn) or Call 9991 93 06 28. Fella is waiting for you! April 18, 2017: Melody is a Pitbull cross. She is very affectionate, intelligent and has lots of energy. She loves to cuddle. 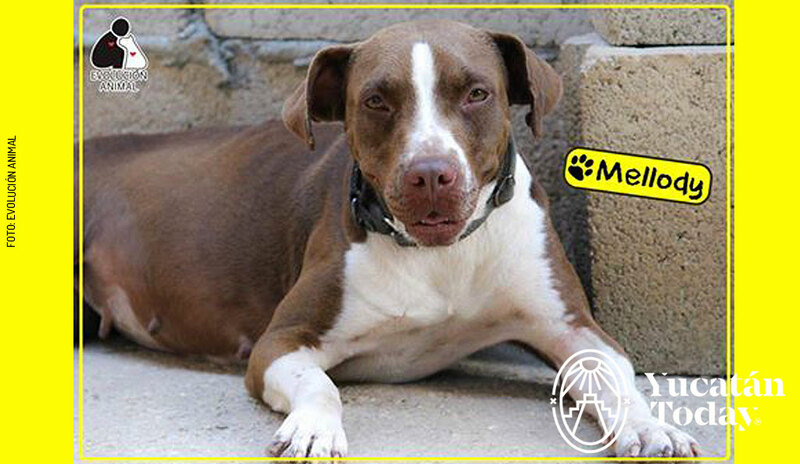 Melody was abandoned by her previous “family” and needs a home where she will be a single child as she is territorial and defends her food from other dogs. Melody will be a beautiful addition to your family and a faithful companion. Come and meet Melody at Evolución Monday to Sunday from 9 am to 12 pm. (Google map https://goo.gl/AjJ9Pn) or call 9991930628. April 11, 2017: Buchita is charming, playful, curious and affectionate. She gets along with all the dogs at the shelter. 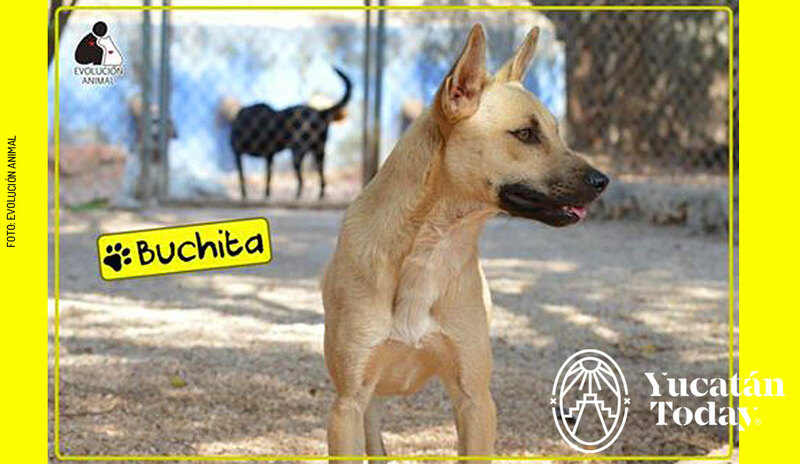 Buchita loves to walk and needs to be a part of family activities. She loves her treats. She is up to date on her shots and spayed. Come and meet Buchita at Evolución Monday to Sunday from 9 am to 12 pm. (Google Map https://goo.gl/AjJ9Pn). For more info on this special girl please phone 9991 93 06 28. Hola! My name is Cindy! April 4, 2017: I wish you a sunny and joyful day! 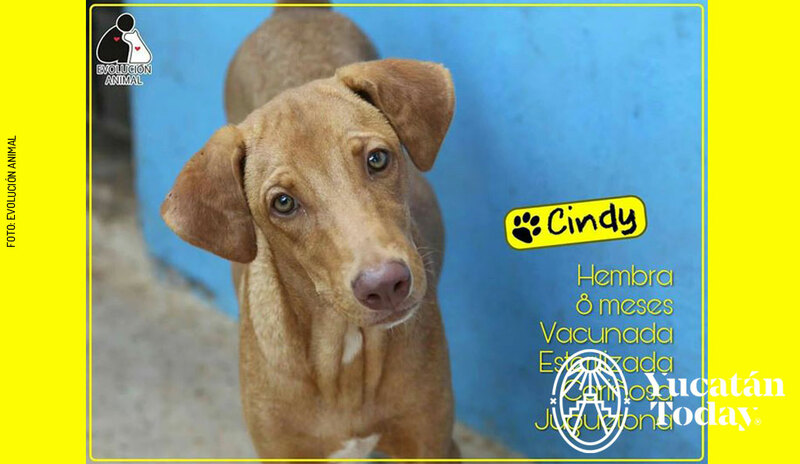 I’m an 8-month-old, medium-large pup; vaccinated, dewormed and sterilized. I’m a bit shy but when you gain my confidence I’ll cover you with kisses. I’ll always be by your side and we’ll play a lot! Come to Evolución to meet me! If you cannot adopt please share my post with your family and friends. Call 9991 93 06 28 right away – I’m waiting for my special family to come along! Hugs and kisses, Cindy. March 28, 2017: Kau was officially handed over to Evolución by the Umán police. The police were called to attend a family that did not have the appropriate facilities in their home to house Kau in a safe way. Kau was escaping on a regular basis and attacking animals. 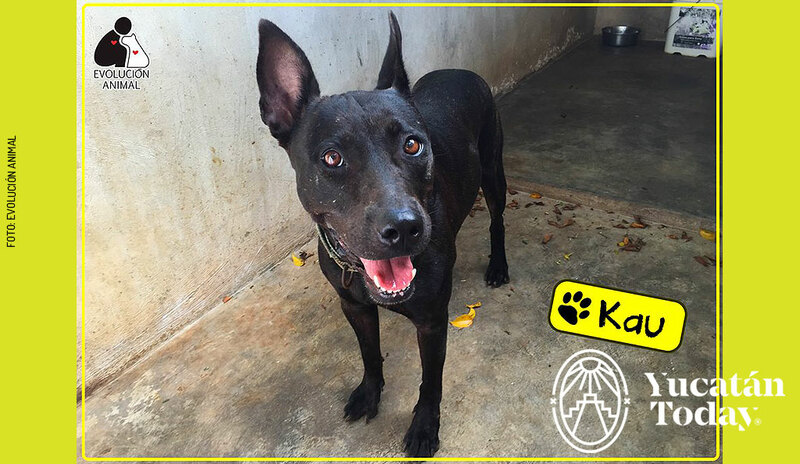 However, Kau is very sociable and very affectionate with humans, ideal for an active family who will take her for daily walks. She needs a secure, fenced yard and to be an only pet. 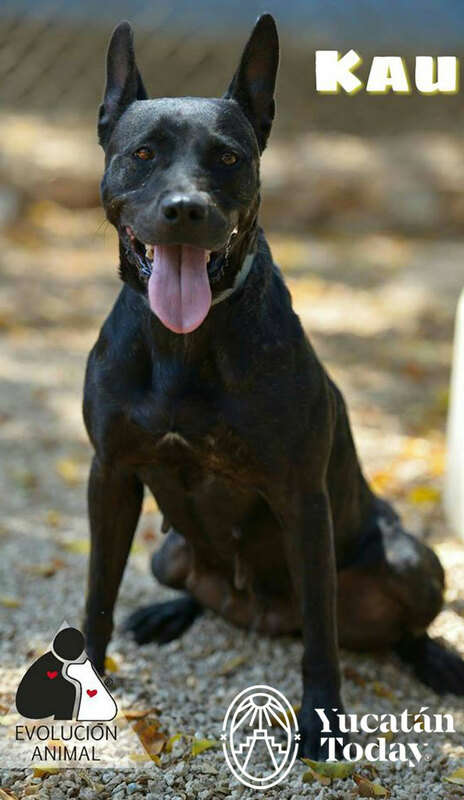 Can you offer Kau the good life she deserves as an important part of a home and a family? Come to the shelter to meet Kau. You will enjoy taking her for a walk as she is very well behaved on a leash. Evolución hours Monday to Sunday from 9am to 12pm. (Google Map https://goo.gl/AjJ9Pn) 9991 93 06 28. February 21, 2017: Turix lived with a family; however, a few years ago his family moved without taking him. After many weeks on the streets he suffered a serious accident which was not immediately attended to. Evolucion stepped in and got Turix the medical attention he needed before taking him to the shelter. He has lost an eye but that doesn’t hold him back, he is a confident, intelligent, affectionate little dog who gets on well with other dogs but not so much with cats. He walks very nicely on a leash and he LOVES cookies! He is neutered and up to date on his shots. To meet Turix please call 9991 93 06 28. February 7, 2017: Beasley was rescued with his siblings when they were barely a few weeks old, now he is a 4 month old puppy. 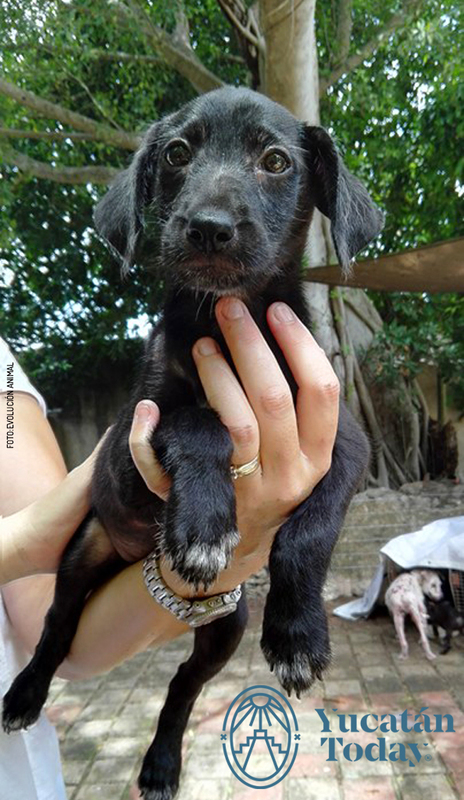 He is now healthy, vaccinated and sterilized and is ready for a forever home. 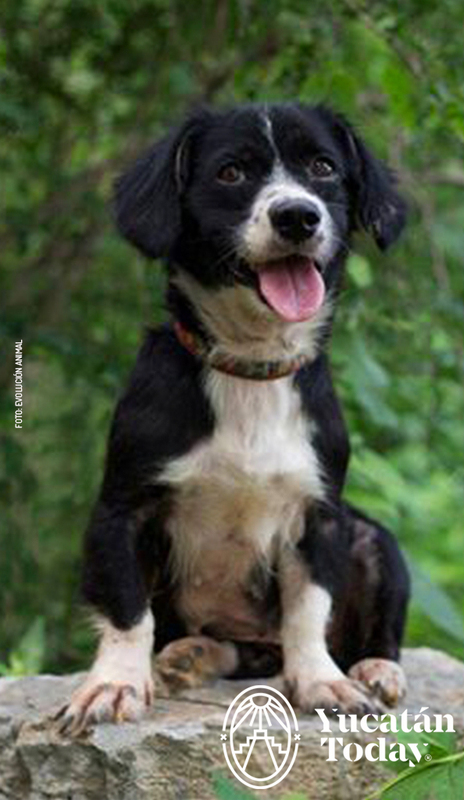 Beasley is an extremely well socialized, playful, active puppy who gets along with other dogs. If you are interested in adopting Beasley please call 9991 93 06 28. 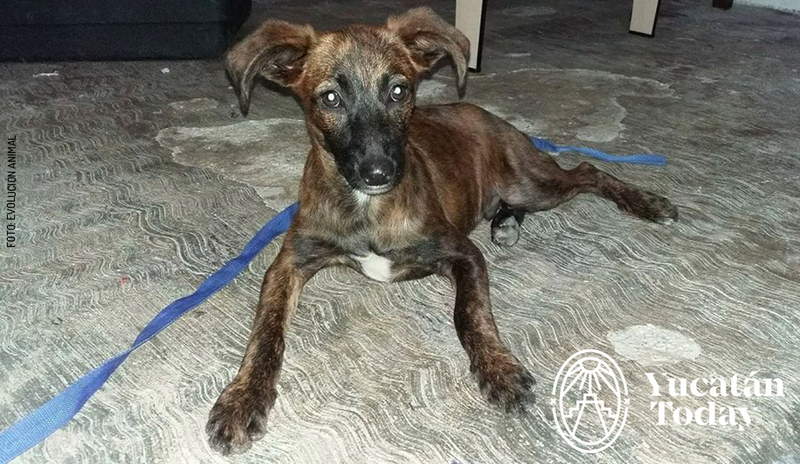 January 31, 2017: Ginger is 4-month old pup who was rescued from the streets of Yucatan with her siblings when they were barely a few weeks old. Ginger is now healthy, vaccinated and sterilized and is ready for a forever home. Ginger is an extremely well socialized, playful, active puppy who gets along with other dogs. If you are interested in adopting Ginger please call 9991 93 06 28. January 3, 2017: Looking for love? So are 8 month old Molly and 2 year old Salbut. They did not have such a great start in life but are now ready for their forever homes. They are healthy and have had all their shots. If you’ve got room in your heart for one of these bundles of joy, please call 9991 93 0628 today. 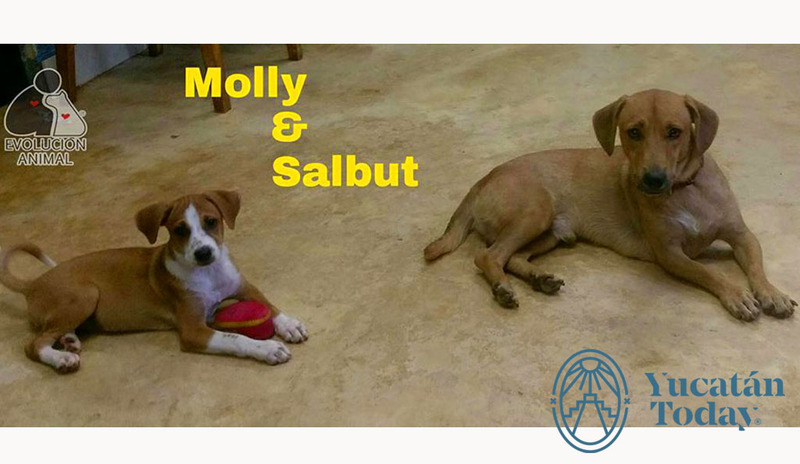 Salbut and Molly are little balls of energy and sweetness, eager to lick your face and ready to play. If you cannot adopt but want to help, please share this posting and photo with your friends and family. Gracias. December 20, 2016: Puppies!! We have a number of lovely puppies of various sizes and ages at Evolucion right now. Today, we’d like you to meet “Ron Burgundy”. 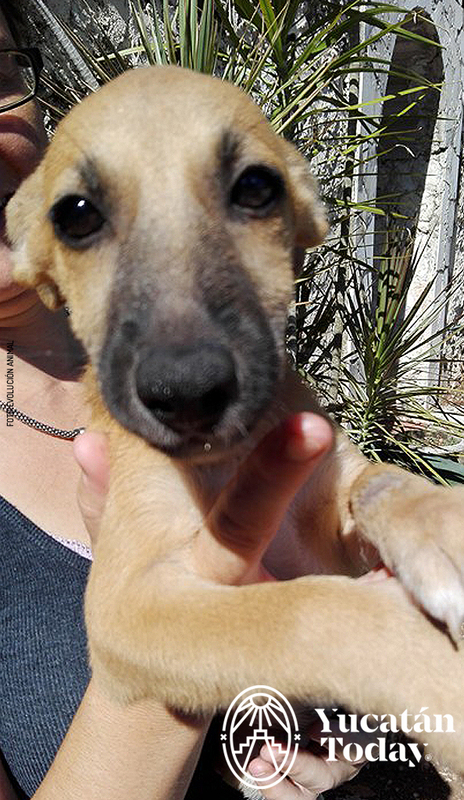 Ron is an extremely laid back, affectionate 3 month old puppy who needs a home. He is extremely well socialized, having been in a foster home until now. He would make a wonderful addition to any family, with or without kids, or with or without other dogs. He is fully vaccinated and dewormed. If you’d like to meet Ron or any of our other pups, pop by the shelter any day of the week (including Saturday or Sunday), between 9 am and 12 pm, or call 9991930628 (English spoken). December 13, 2016: Steel is another Evolucion long-timer who has been at the shelter way too long! 10 year old Steel has been through a lot in his life, having been removed from his “owner” 5 years ago because of an untreated injury to his leg. He underwent major surgery; his leg was reinforced with steel pins for a few months to hold the bones in place. Hence his name! Steel recovered from the surgery but one of his back legs is slightly shorter than the other. This gentle soul enjoys the attention and treats he receives from the volunteers. He is calm and affectionate and just needs a home where he can meander in the backyard as he cannot do heavy exercise because of his injury. 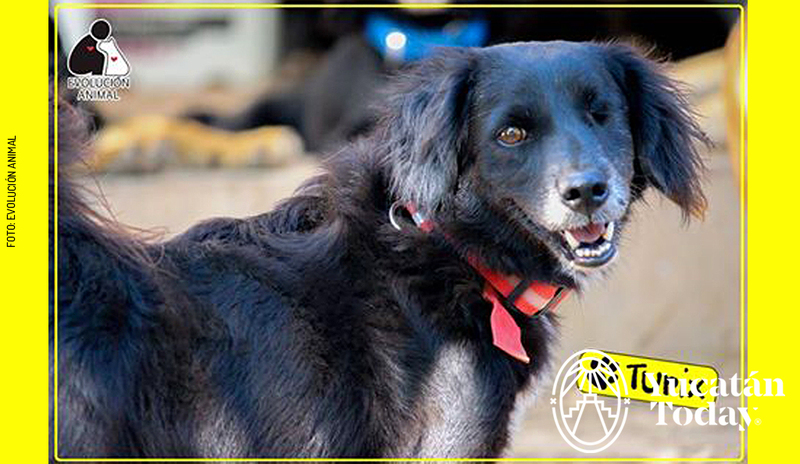 Make Steel’s dreams come true by calling 9991 93 06 28 to visit the shelter to meet him. November 22, 2016: Junior was born at Evolución 4 1/2 years ago and was the only surviving puppy in his litter. He was extremely attached to Spirit who was adopted and, sadly, he has not bonded with other dogs so finds life at the shelter very stressful. Junior is a sensitive and anxious boy who worries about many things. He’d love someone gentle and patient who would visit Evolucion several times so he can get to know and trust them before they take him home – someone with time to settle him to make him feel safe and relaxed. Junior can live with other dogs. If you think you might be able to provide a home that Junior so desperately needs and deserves, please call 9999 70 50 36 today. November 8, 2016: Titis – female, spayed – approx. 3-4 years old – size: small-medium. Titis is a friendly and affectionate girl who absolutely ADORES little girls! Please help us find Titis her forever home by sharing with your family and friends. It only takes one person to fall in love with this beautiful face to change her life forever! Call 9991 93 06 28. October 18, 2016: 1 year old Box was picked up by a Merida Police car in Centro and brought to Evolución. Sadly, we haven’t found his family so Box is up for adoption. Box is a very energetic and playful boy so he needs an active family and space to run and play outdoors. He would be very happy in a home with a female pal. Box is neutered, dewormed and up to date on his shots. Can you offer this handsome boy his forever home? If so, please call 9991 93 06 28. Box is waiting. stop content from being ripped off? I’d truly appreciate it.